Pulse pressure is measured by calculating the difference between the high and low readings on a blood pressure test. Wide pulse pressure (or high pulse pressure) can mean that you are at a greater risk of cardiovascular disease and hardening of the arteries. Abnormally low (narrow) pulse pressure can mean that your heart isn’t pumping enough blood. Blood pressure and pulse pressure are measured in millimeters of mercury (mmHg). Generally, normal blood pressure readings should be 120 systolic blood pressure and 80 diastolic blood pressure. This is usually written as 120/80 mmHg and said as “120 over 80.” This would mean that your pulse pressure is calculated at 40mmHg and is considered normal. Some of the wide pulse pressure causes include a buildup of plaque in the arteries, leaky heart valves, stress, or being overweight. The danger of a persistent increased pulse pressure is that it can cause damage to your arteries and puts your heart under greater stress. In many cases, making positive lifestyle changes to improve your heart’s health can affect pulse pressure and help to reduce wide pulse pressure. In this article, you will find the answer to what it means if you have an increase in pulse pressure. You will also learn about the dangers of wide pulse pressure of 60 or more, or what you should do for pulse pressure of 20 or less. I will also look at medical research into ways to decrease widened pulse pressure. What Does Wide Pulse Pressure Mean? Why Is It Important? A wide pulse pressure can mean that you are at a greater risk of cardiac issues even though you may not have high blood pressure. Therefore, widened pulse pressure is an important measurement when checking the overall health condition of your heart. You can easily calculate if your pulse pressure is within the normal range by subtracting the higher number of your blood pressure readings (systolic pressure) from the lower number (diastolic pressure). For example, a normal blood pressure reading of 110/70 mmHg would show that your pulse pressure is normal because it is 40. However, a high blood pressure reading of 140 mmHg systolic pressure over 70 mmHg diastolic pressure calculates pulse pressure at 70 mmHg. What Are Low, Normal and High Pulse Pressure Levels? Let’s look briefly at narrow, normal, and wide pulse pressure levels. Normal pulse pressure. The normal pulse pressure range is usually between 40 mmHg and 60mmHg. When learning about the meaning of wide pulse pressure, many people wonder if they should be more concerned about high blood pressure readings or wide pulse pressure readings. Even though wide pulse pressure can be connected to high blood pressure, that isn’t always the case. Systolic blood pressure measures the pressure in your arteries when your heart beats. Diastolic blood pressure is the pressure that blood exerts in your arteries between heartbeats. Wide pulse pressure increases when there is a loss of elasticity in the arteries, and depending on your blood pressure, wide pulse pressure can cause organ damage or lead to heart failure. For example, a person could have very high blood pressure with readings of 160/120 mmHg, however, pulse pressure is 40 which is considered normal. However, there are many cardiovascular risks associated with high blood pressure, and you should take steps to lower your blood pressure even though pulse pressure is normal. Normal blood pressure. Less than 120 mmHg systolic blood pressure and 80 mmHg diastolic pressure. Elevated blood pressure. Still considered normal, elevated blood pressure is between 120 mmHg and 129 mmHg systolic blood pressure with a diastolic blood pressure of lower than 80. If blood pressure is consistently elevated, you should take steps to control your blood pressure. Stage I hypertension. Systolic blood pressure 130-139 mmHg or diastolic blood pressure 80-89 mmHg. Stage II hypertension. Systolic blood pressure higher than 140 mmHg or diastolic blood pressure greater than 90 mmHg. Hypertension crisis. Systolic blood pressure greater than 180 mmHg and/or diastolic blood pressure higher than 120 mmHg. You should seek prompt medical help if you have a hypertension crisis. Let’s look in more detail at the various wide pulse pressure causes and the health conditions that can affect the health of your heart. Coronary heart disease caused by plaque that builds up in your arteries can cause widened pulse pressure. Narrowed arteries caused by plaque can result in your heart not being able to pump enough blood around your body. Squeezing chest pains are one of the types of pain you should never ignore. You should always have chest pains checked out by a doctor, especially if you start getting new pains in your chest. Aortic regurgitation is sometimes referred to as leaky heart valves and can cause an increase in pulse pressure as your heart works harder to pump blood around your body. Aortic regurgitation occurs when some blood flows in a reverse direction back from the aorta into the left ventricle (chamber). An aortic dissection can cause widened pulse pressure along with sudden chest pains that feel like a jabbing sensation in your chest. Endocarditis is an infection of the inner lining of your heart chamber and valves, and is one of the widening pulse pressure causes. In severe cases, sepsis can cause wide pulse pressure if it affects the heart and causes endocarditis. Anemia can be the result of chronic kidney disease and is another reason for wide pulse pressure along with other symptoms of anemia. Some of the ways of protecting your body from the effects of anemia are to increase iron levels in your blood. Chicken liver, beef, and green leafy vegetables are all important sources of iron. Also, you should make sure that you don’t have a vitamin B12 deficiency. Being under extreme emotional or psychological stress can affect your heart function and cause higher pulse pressure levels. Stress can also affect levels of cortisol in your body and cause sleep problems, digestive issues, and cause signs of premature aging. There are many natural ways to deal with stress better. For example, you can use essential oils to relieve anxiety and stress and also treat the symptoms of mild depression naturally. Obesity and being overweight puts extra pressure on your heart and can cause a number of heart-related issues, including wide pulse pressure and high blood pressure. At the end of the article, you can find some helpful ways to reduce elevated pulse pressure, lose weight, and improve the health of your heart. The aging process reduces elasticity in your arteries and is one of the causes of increased pulse pressure in the elderly. Studies about the effect of pulse pressure on cardiac disease have found that low or wide pulse pressure can help predict the outcome of heart-related conditions. 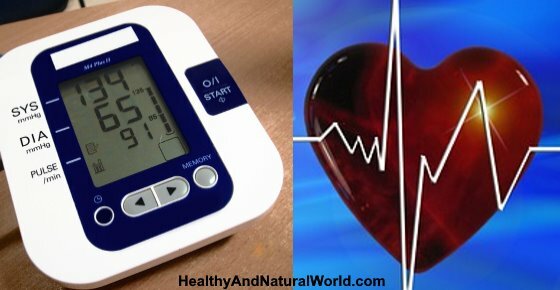 Just as some negative lifestyle choices can affect pulse pressure negatively, you can also improve the health of your heart and normalize pulse pressure readings naturally. Let’s look at what you can do to lower wide pulse pressure. Regular physical exercise is one of the best ways to normalize wide pulse pressure and lower blood pressure naturally. In my article on how to transform your body with a 10-minute workout, you can find some exercises you can do at home to improve your cardiac health. You will also find that regular aerobic training helps to lower blood pressure naturally. Consuming enough omega 3 in your diet or taking omega-3 supplements or fish oil can help to reduce widened pulse pressure and also boost your heart’s health. For example, the American Journal of Hypertension reported that fish oil containing DHA (docosahexaenoic acid) and EPA (eicosapentaenoic acid) helps to reduce blood pressure. It was also found that omega-3 supplementation can also help to prevent high blood pressure.18 Other studies have shown a link between consuming omega 3 and lowering pulse pressure. To find out food sources of omega 3, please read my article about the many reasons to consume more omega 3 fatty acids. Dieting if you are overweight or obese is a great way to reduce widened pulse pressure and reduce your symptoms of cardiovascular disease. If you need to lose weight quickly, please read my article on how to lose 30 pounds in a month. There you can find safe ways to shed extra pounds and reduce your amount of belly fat naturally. You can also try these 12 simple tweaks for weight loss, or you might just increase the number of steps you take in a day to lose weight and improve your cardio health. Another way to affect your pulse pressure is by supplementing your diet with folic acid. Folate or folic acid is part of the B-group vitamins and have a positive effect on your cardiac health. High blood pressure or hypertension can have a damaging effect on your cardiovascular health. If left unchecked, high blood pressure can put you at greater risk of suffering a heart attack or stroke. MayoClinic. What is pulse pressure? Tex Heart Inst J. 2010; 37(3): 284–290. Ital Heart J Suppl.2001 Apr;2(4):359-62. J Am Coll Cardiol.2001 Mar 15;37(4):975-84. HeartOrg. Understanding blood pressure readings. Heart. 2006 Jul; 92(7): 994–1000. PLoS One. 2014; 9(12): e114309. Front Psychol. 2016; 7: 1682. J Am Soc Hypertens. 2012 Jul-Aug; 6(4): 277–283. Cardiol Res Pract. 2011; 2011: 263585. J Am Coll Cardiol. 2001 Mar;37(4): 975-984. Am J Hypertens. 2011 Oct; 24(10): 1121–1126. J Clin Hypertens (Greenwich).2005 Aug;7(8):455-63. Am J Clin Nut. 2005 July;82(1): 26-31. WebMD. Know your blood pressure numbers. WebMD. Symptoms of high blood pressure.